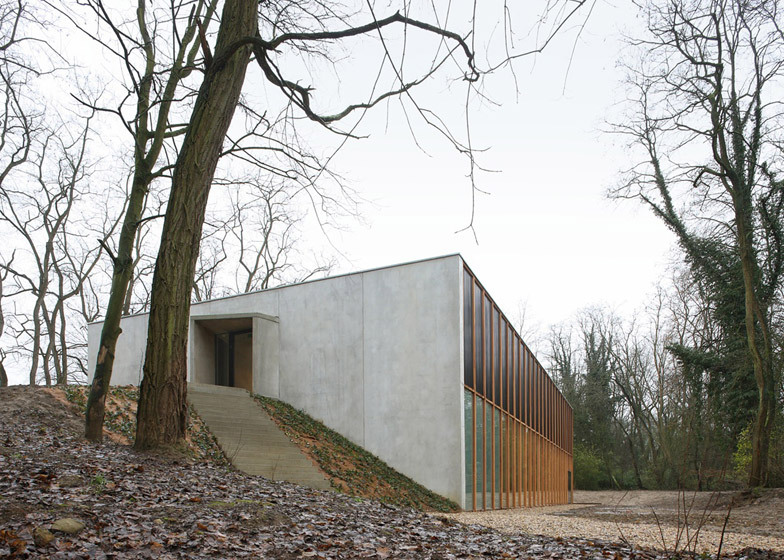 This concrete sports hall by Belgian studio URA has been built into a hillside in the wooded grounds of a school just outside Brussels (+ slideshow). 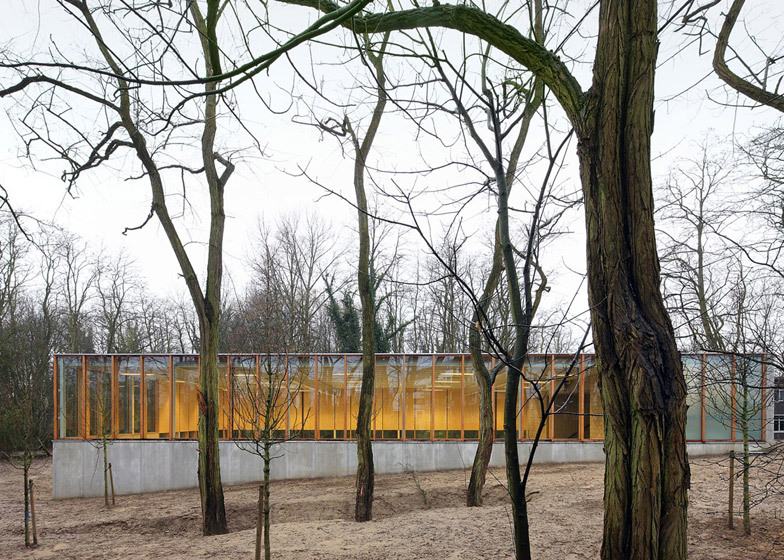 URA was tasked with designing the new gymnasium for Koninklijk Atheneum Ukkel (KAU), a school in the south of the city that describes its campus as the "biggest garden in Brussels". Rather than positioning the building at the top or bottom of the sloping site, the architect chose to insert it into the topography so that two of the facades function as retaining walls. 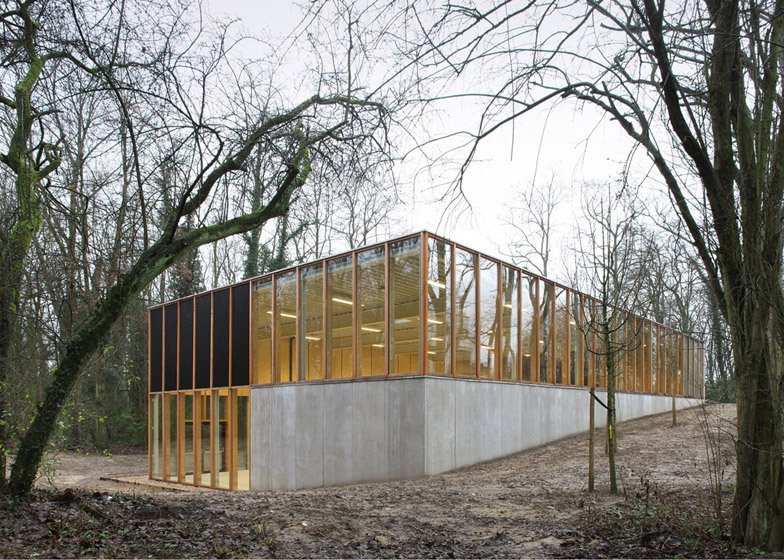 "The surrounding forest was the starting point for URA to design a simple building which contains all confrontations of the site: open versus closed, trees versus slope, materiality versus transparency, building versus environment," explained studio founders Yves Malysse and Kiki Verbeeck. The entrance sequence frames the building's layout – visitors climb an external staircase to arrive at a first-floor entrance. Once inside, they then descend towards a games hall that sits level with the lowest part of the site. 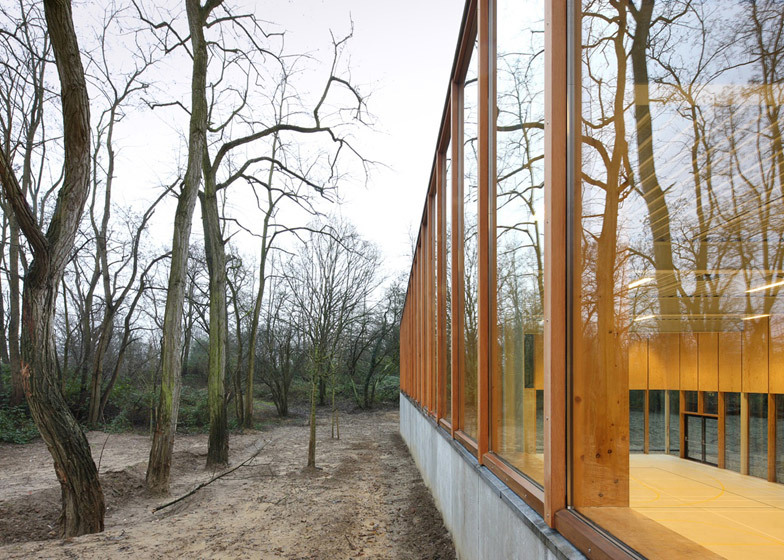 Large areas of glazing correspond with the building's relationship to the ground. 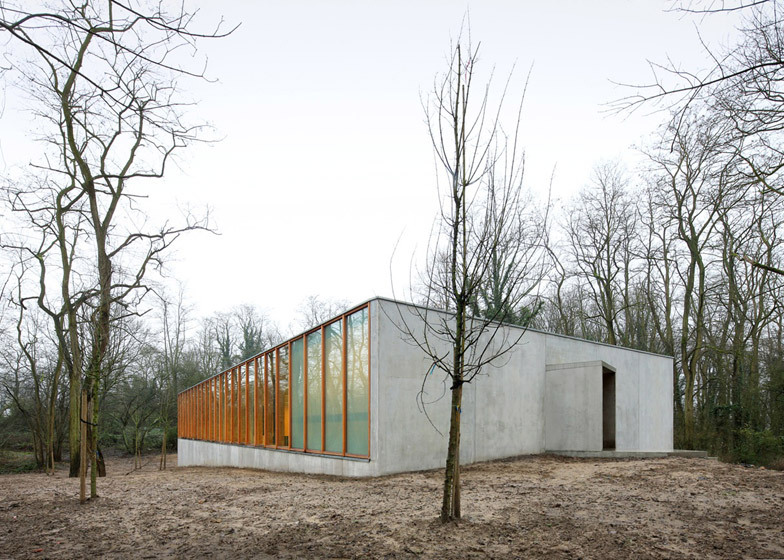 Concrete wraps around the base of walls that nestle up against the landscape, with glazing above. 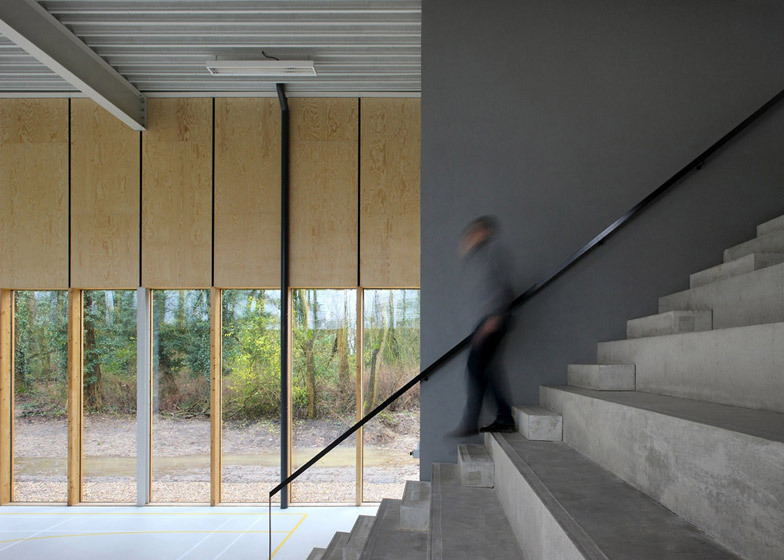 Meanwhile the western elevation is glazed along its lower section only, with the upper section of wooden frame infilled with black steel panels. "The facade shows the duality of the context: a strong, closed concrete wall on the one side and a wooden structure with a black steel-plate-clad facade on the other side," said the architects. "Going to the gym confronts the pupils with the basic elements of nature," they added. 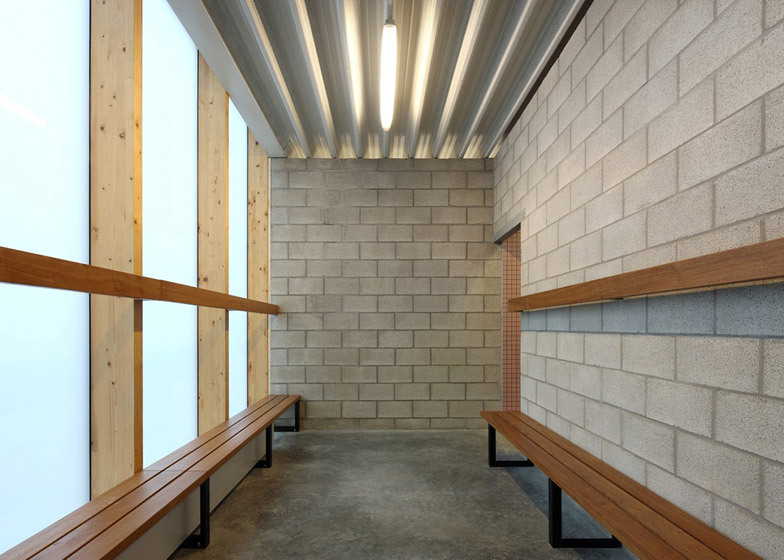 Changing rooms and toilet facilities can all be found on the upper level and are arranged symmetrically in plan. The staircase leading down to the lower level has a tapered form that widens at the base, so it can be used as an informal seating area for spectators. 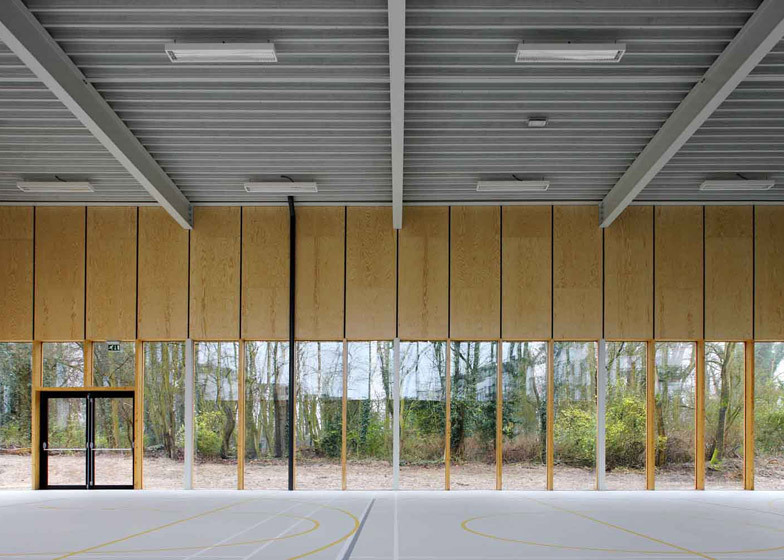 Concrete surfaces are left exposed inside the hall, while other parts are covered with afzelia hardwood boards. 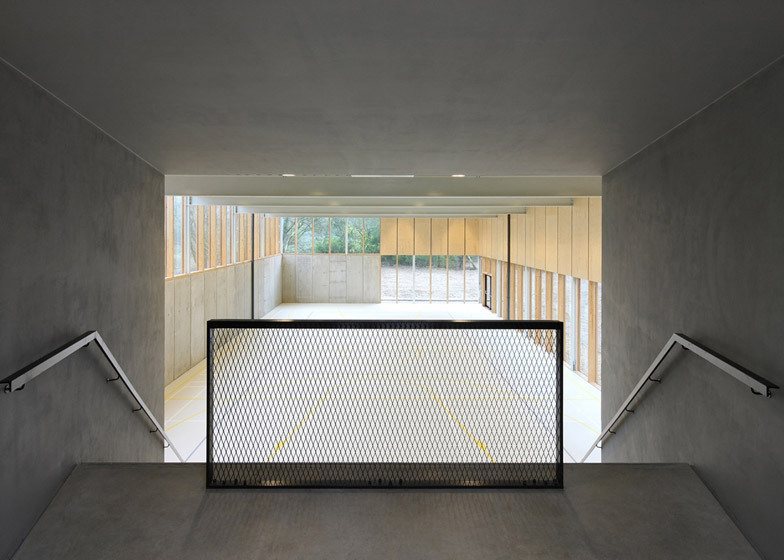 The floor is finished with a heavy-duty grey vinyl surface, with games courts marked out in shades of yellow, grey and white.